The kids are so excited to sprinkle their reindeer food on the lawn tonight. I made them for my kids and Anne gave them to each of her classmates at their Christmas party last Thursday. I mixed oatmeal and sliver glitter and poured it in a plastic test tube. I made the “simple and easy” tag using the stamp set “Reindeer Food” from The Angel Company and tied it around the tube with red ribbon. I used red Stickles to make Rudolph’s nose shine. If you haven’t already, you can quickly make this project. 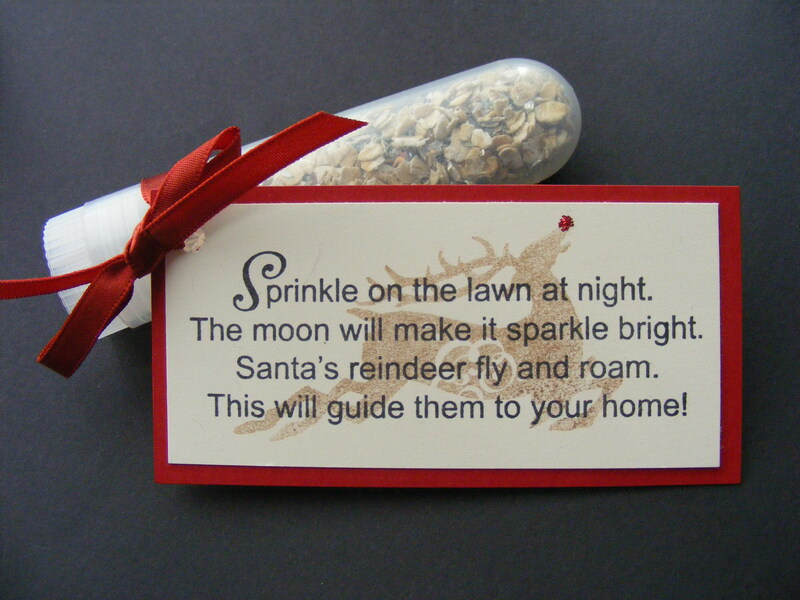 Put the reindeer food in a plastic baggy if you don’t have access to a tube. This entry was posted in Rubber Stamped Items, Treat Bags and Boxes and tagged Food, Glitter, Oatmeal, Reindeer, Reindeer Food Poem. Bookmark the permalink.